Ten days until Tulip Fever starring Alicia Vikander hits theaters : You still have time to read the book. I wouldn't bother. The book annoyed me. Something about the novel by Deborah Moggach—I only read it because I couldn’t find her The Best Exotic Marigold Hotel at the library—left me cold. The story of a married woman who has an affair with the artist hired by her old man of a husband to paint her portrait raised my judgmental hackles and left me humorlessly denouncing it. We are not amused, I pronounced when I read it back in 2012. But I have high hopes for the film coming out on July 15th. Sophia, the young married woman is being played by Alicia Vikander and the artist—Jan Van Loos— is the interesting looking actor Dane DeHaan, soon to be seen as James Dean. With Christoph Waltz as the older husband (not as old as I imagined him), I think Tom Stoppard’s screenplay will provide more motivation for the affair than the usual lust to lure the pair into their shenanigans. Not that lust hasn’t driven many a man and woman into compromising situations. It’s just that in my recollection of the novel, the husband is a decent sort while the young woman, seems to have little turmoil about resisting. Set in 17th century Holland, the title comes from the higher and higher prices tulips were fetching at the time, creating a ‘tulip fever’ market which the adulterous pair planned to cash in on. Judi Dench co-stars along with Holliday Grainger, Jack O’Connell, Zach Galifianakis, Matthew Morrison, Tom Hollander and Cara Delevingne. Cressida Bonas, one time girlfriend to Prince Harry also plays a role. Justin Chadwick directs. 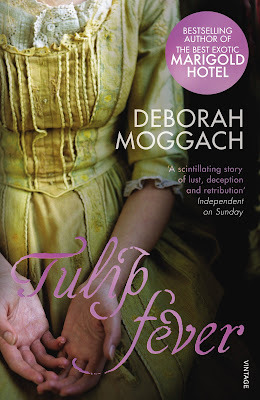 Have you seen the trailer for Tulip Fever? Don't forget to expand it in your browser.